In the final years of his life, Wain’s cats became more abstract and less whimsical. His once playful cats began to resemble fearsome, almost kaleidoscopic, Hindu deities. Many psychological textbooks feature drawings from various stages in the artist’s career to show the progression of Wain’s schizophrenia. 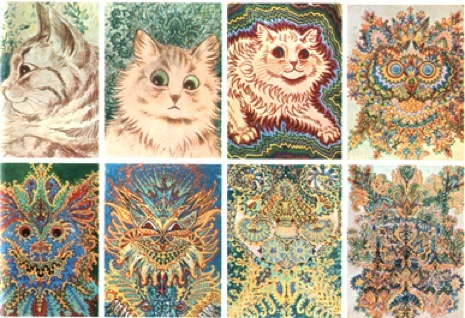 More via Louis Wain: The Man Who Drew Cats. Authorities say a man who was waiting with several friends for a "ghost train" from a North Carolina legend was killed when a real train came down the tracks.